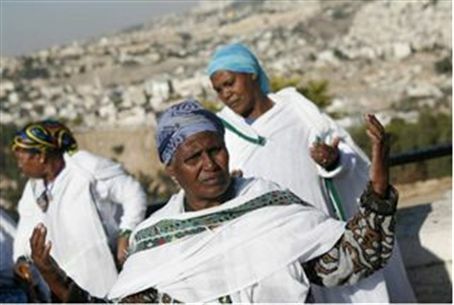 A modern “exodus” story took place in recent months, as one of the last Jews in Sudan managed to make her way to Israel. A modern “exodus” story took place in recent months, as one of the last Jews in Sudan managed to make her way to Israel – more than 30 years after she had planned to make it. Takla's story (her real name is a secret, for her safety's sake) begins in 1980, when as an 18 year old girl she began a trek from her native Ethiopia to Israel, joining thousands of others of the Beta Israel community in making their way to the Land of Israel. To get to Israel, the land trek required passing through Sudan, and while most of the Ethiopian olim were able to pass through that country without incident, Takla was waylaid – and forced to marry a Muslim man and remain in Sudan. Thirty four years later, Yedioth Ahronot reporter Dani Adino Ababa discovered, Takla had five children with her Sudanese husband, with none of them having any awareness of their Jewishness. Takla was herself forced to live as a Muslim, but never gave up hope of getting to Israel. About six years ago, she managed to make contact with a representative of the Jewish Agency and told him her story, but she was unable to maintain contact. About four months ago she was able to reach another Jewish Agency representative, and again pleaded for help in leaving Sudan. The story eventually reached Asher Siyum, the Jewish Agency's official representative in Ethiopia, and he decided to take action. After doing some digging, Siyum discovered that Takla's family had managed to get to Israel years before. The message was sent back to her, along with instructions on how to get away from her husband and back to Ethiopia – from where she would be flown to Israel. Takla told her husband that her parents were ill, and asked for – and was granted – permission to go to Ethiopia to tend to him. From there, it was a short road to Be'ersheva, where Takla has been staying since arriving in Israel on Passover eve. She has asked the Jewish Agency to help them come to Israel is well, but if that is not possible, she may return to Sudan, she said.